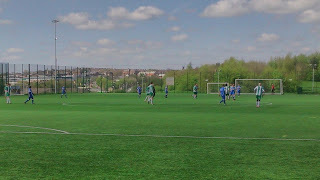 One of the challenges when following Staffordshire County Senior League football is actually knowing who plays where? Clubs do have a habit of being somewhat nomadic. This is not a problem unique to this particular league, but it's a problem for football at County League level full stop. The reason behind this is typically because a good number of grounds are hired by the clubs, and then there comes a point when charges rise, and costs can't be met, so as a result they up sticks and move somewhere else, or they just pack up. This league in particular is very good in the sense that it publishes it's handbook, which gives the locations, and at the start of the season it's invaluable because more often than not someone will have moved somewhere new, and without the information from the league you would never know. But more importantly, it gives the details of the club officials, and it is these people who go along way towards helping neutrals like me make decisions regarding where to travel to on a match day. Ben Cook at Staffordshire LA falls very much into that category. I contacted him earlier in the season during a period of snowy weather, and despite admitting to me he had something like 17 texts on his phone asking if the game was on, and having also been at work he had no chance to respond to any of them, he still made the point of picking up the phone to me to keep me posted. That day the game at the Gordon Banks Sports Centre was called off due to the snowy surrounds, and thanks to Ben it saved me a wasted journey. 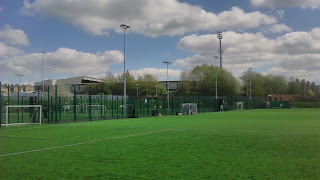 Then, a couple of months back, my mate Steve planned to visit LA, but we had heard they'd moved to the Dimensions Sports Centre, he spoke to Ben, who confirmed the details of the game, and at the same time confirmed the club were planning to at least see the season out at the new venue. So, with one home game left, I decided to go for it, the last remaining ground I needed to visit in the league, it was time for a precautionary text to Ben, and I did that for two reasons, to check they were still at Dimensions and also to check the the kick off time as only a hundred yards away Port Vale were playing Bolton Wanderers in a crucial League One fixture. Vale Park In Close Proximity - The Battle Was Soon To Commence! He came back to me, confirmed all was ok, so I responded and pointed him in direction of this blog. He came back to me later that night having browsed it and said he was impressed, and hoped to see me the following day. Things like that make you feel good about a club, and make you want to pay them a visit, it doesn't take much, but those first impressions are really important. Now then, the Port Vale game, lets box that debacle off first of all. I arrived an hour before kick off, knowing that in turn would get me to the vicinity of Vale Park about 90 minutes before a game that Vale were desperate to win to stay up, and Bolton needed to win (subject to Fleetwood's result) to go up. Bolton bought 4,000 to the game! It was going to busy, but thankfully by arriving early I didn't have too many issues in the way of traffic or parking, and then after the game I could get away before the madness commenced. It wouldn't have mattered anyway, the game finished way later than it should have done thanks to a significant delay while Vale and Wanderers fans decided to have a battle on the pitch. I don't know what the centre of Burslem was like after the game but I suspect it was tense. 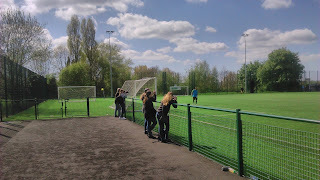 The Dimensions Sports Centre sits right behind the home end at Vale Park, the noise of the crowd is clearly audible, and to access it you simply head down Scotia Road and enter the car park, which on a Vale match day has people streaming through it to get to the stadium. A pint was enjoyed in the cafe area, before heading up the slope to the artificial pitch that LA are calling home. 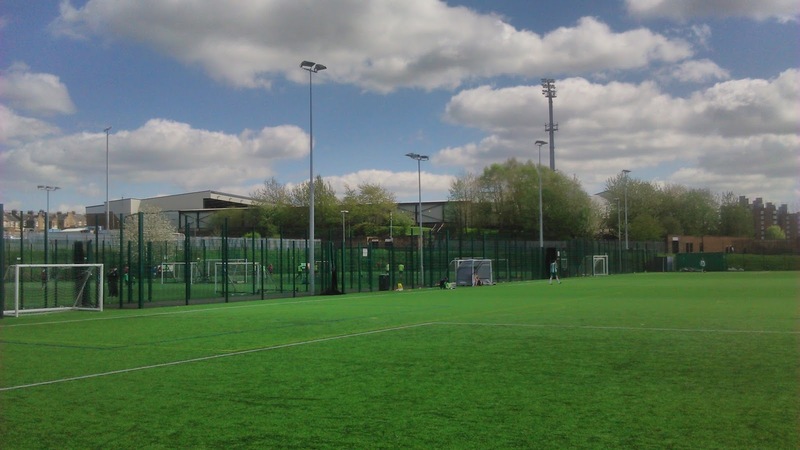 I overheard an Eastwood Hanley player say in the warm up that it was the best artificial pitch he'd played on, and to be fair from where I was stood it looked to play very well indeed. In terms of viewing, you had two options, behind either goal, for half the width of the pitch, that was it. As the game kicked off it was slightly bizarre that four women turned up with both cameras and video recorders to take some shots of the game. Quite why I don't know, unless one of the clubs has a very active media department that requires such photographic attention? If I was a betting man I would suggest students from the nearby Universities of Keele or Staffordshire. The game, right, this is where it gets a bit awkward, because Ben will probably at some stage read this! After twenty minutes Eastwood were 5-0 up, it had been a complete massacre, but to be fair to LA they rallied and only conceded once more in the remaining twenty five minutes of the first half. The second half was no better, a further six goals went past LA but they did pull one back. Was it a fair outcome? Well, Eastwood could have had countless more but to be fair some good defending and indeed goalkeeping kept other goal bound efforts out. Were LA that bad though? Going forward they looked ok on the rare occasions they did, but ultimately Eastwood ran rings round them, they were a significantly better side who played with movement, pace and no lack of skill. The league table would demonstrate that, Eastwood are set to achieve a promotion position, LA look set to finish in a relegation berth. I made a quick exit at the end, I think at that moment in time the first punches were being thrown on the pitch at Vale Park. I never did catch up with Ben, I don't know if he was a player, or a member of the management team, but I suspected he was best left alone after this hammering.